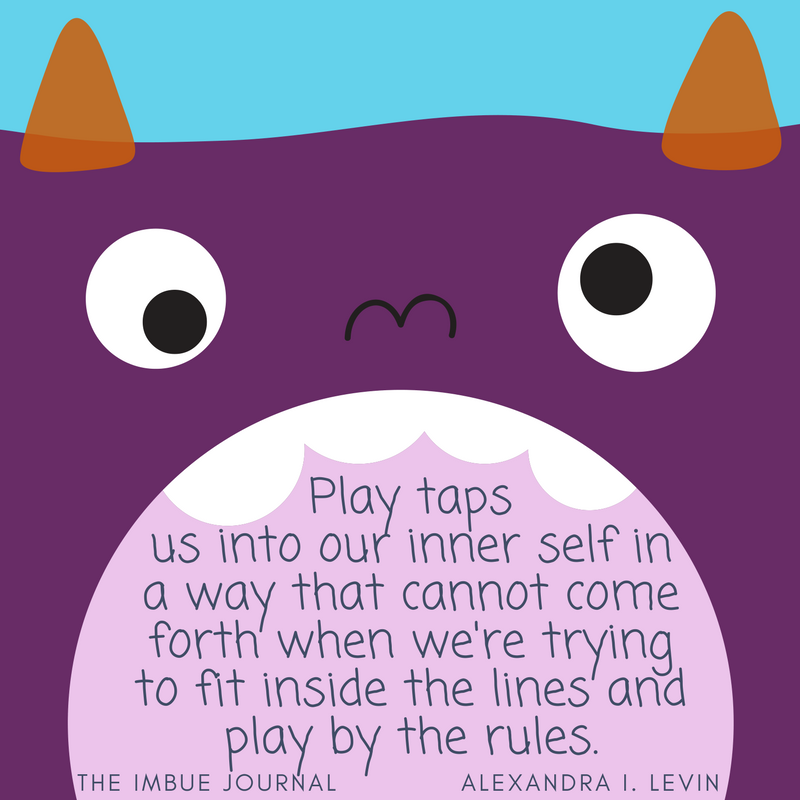 Tag Archives for " quote "
Today I bring you a quote from The Back Forty INFUSE Program. Take a moment to read the quote and, as always, I’ll meet you on the other side. The first part of this quote that I want to make sure you understand is the reference to “the front 40”. 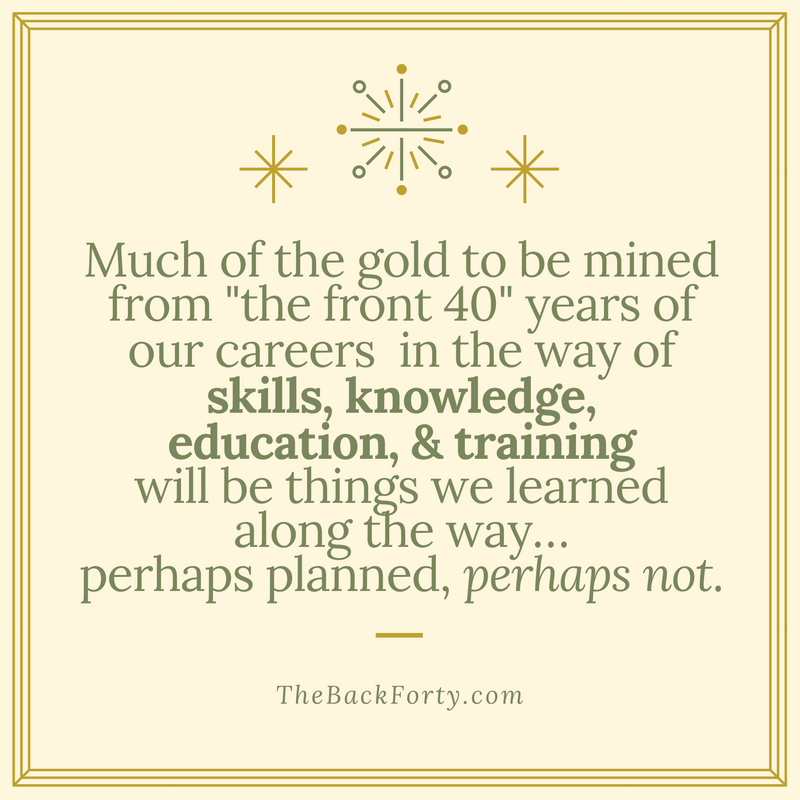 It is a pretty common misconception that the “front 40” correlates to the first 40 years of something and the “back 40” correlates to the last 40 years of something. As it turns out, that is not the case. 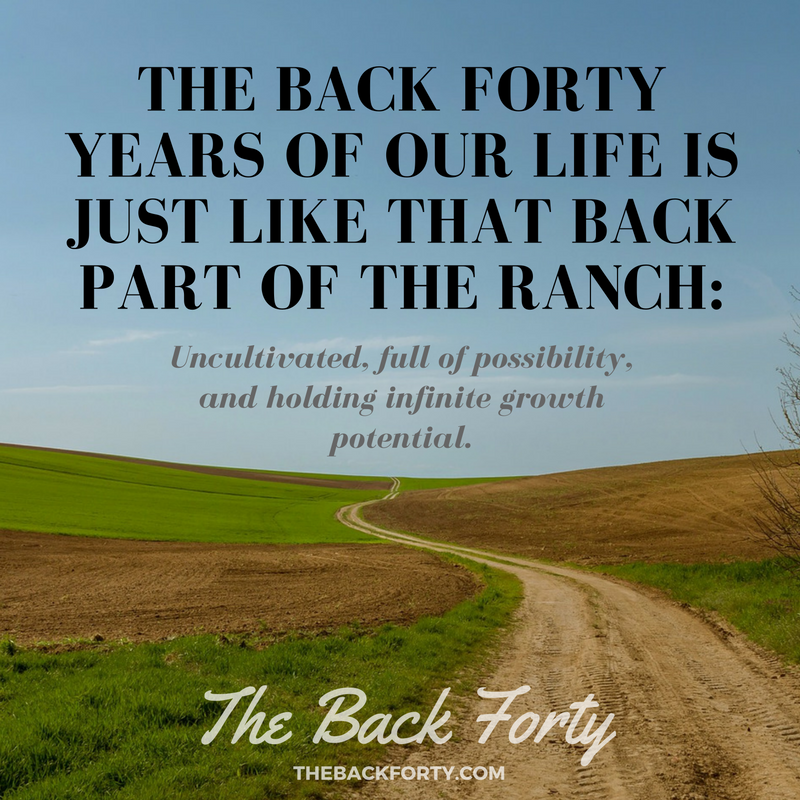 The front and back 40 are just metaphors for the first and second half of something, whether it be life or career (if you want to learn more about exactly what “back forty” means click here). Okay. Now that we have the confusing part sorted out, we can move on to the meaning of the quote. The thing I like about this quote is that it is a reminder of how far each and every one of us has come. Think about everything you have learned in your various jobs and careers up until this point. Chances are that if you actually take some time to think about it, you have learned so much more than you usually even think to acknowledge. What are the skills, knowledge, education, and training that you have learned along your journey? I bet that the first things you started thinking of are your formal education and training, or maybe different skills you have honed like writing skills or negotiations. But I want you to look even further beyond those “planned” skills. What have you learned that you were not planning to learn, what have your hardships taught you? Your mistakes? If you take the time to actually catalog every single skill you have acquired – chances are you are even more skilled than you were aware of. And that is what I want you to take with you throughout the rest of the day. You are unique and skilled in ways that not everyone is aware of and when you add up all of your skills, you are a rare individual whose unique skills are unmatched by anyone else. Now go show the world what you are made of! Are You Sharing You Unique Inner Light With the World? 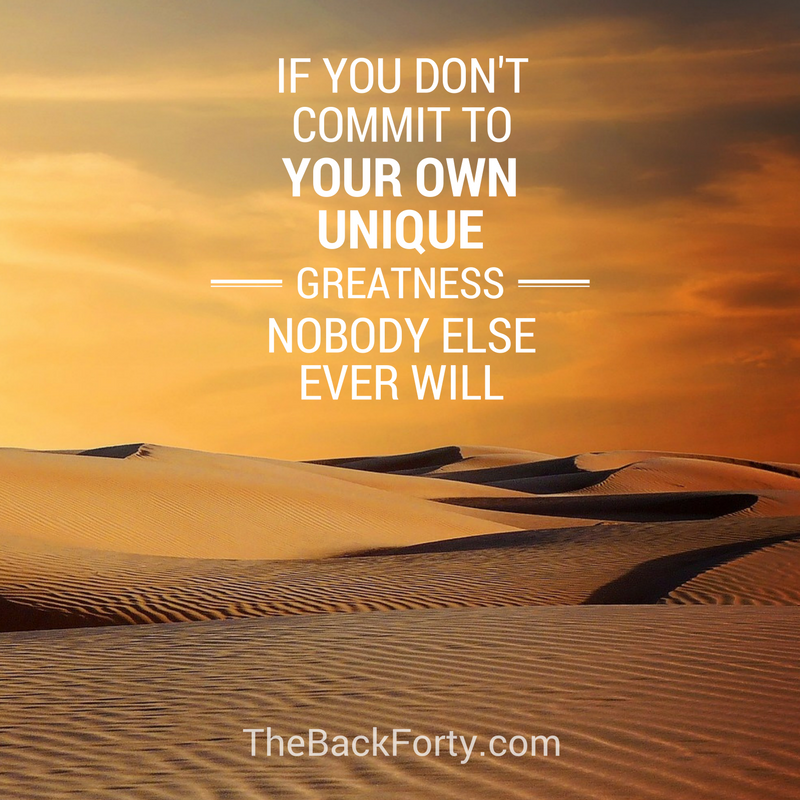 Today I am bringing you a little inspiration from our Back Forty archives. Take a moment to read the quote and I’ll meet you on the other side. This is an interesting viewpoint. Everyone has heard the phrase “let your light shine” but we don’t usually take the time to consider it much. For me, the phrase reminds me of my childhood when I would sing “This Little Light of Mine”. The way I always interpreted it, the song was about being yourself and not being afraid of what other people think. But what if it means so much more? What if your “own light” isn’t just being yourself. What if it is what makes you unique? 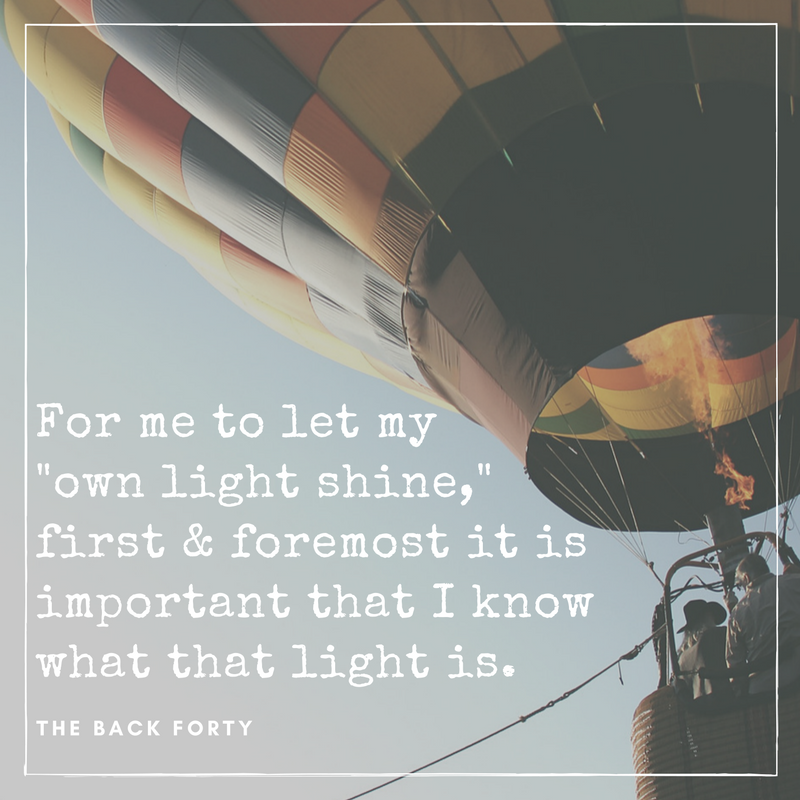 These two phrases might seem very similar, but when we put it in the context of letting your light shine, it shifts the meaning in a pretty profound way. You can “be yourself” every day, but that doesn’t mean that you are sharing what makes you unique with the world. “It is important that I know what that light is.” I feel like that is the most important part of this whole quote. We have to know what makes us unique. Now tell me, when was the last time you actually thought about what makes you unique? About what your personal “light” is? Do you know? Today my goal for you is two-fold. First, spend 5 minutes thinking about what makes you unique and how you can share that uniqueness with the world around you. Then, do it! You are unique. You do have your own personal inner light. And you need to share it with the world. Why? Because, if everyone took the time to share their own inner light with the world, think about how much better we could make this world we live in.